As is usual for the first one of the month, this is set up to be a busy week for economic activity that can affect the Foreign Exchange markets. Already, this morning, there is the news that the Chinese official Manufacturing Purchasing Managers’ Index (PMI) has fallen slightly. This was in line with expectations but confirms the softening of Chinese economic growth. Tomorrow, Tuesday, albeit at 03:30 GMT, in other words when we will be in slumberland, the Reserve Bank of Australia (RBA) will announce its interest rate decision. The bank would like to see a devaluation of the Aussie dollar and this would normally tend to indicate a bias towards reducing rates, but Australia has a problem with inflation, in particular housing inflation and this will militate against such a move. They have been attempting to talk down the currency and this is most likely to continue. New Zealand employment data also comes out on Tuesday, but at the other end of the day, in the evening GMT. Wednesday sees ADP payroll figures for the USA. This private company attempts each month to use its own databases to anticipate the official Non-Farm Payrolls number, which is closely watched by all. Sometimes they are more accurate in this than at other times. Last month showed a sizeable discrepancy. 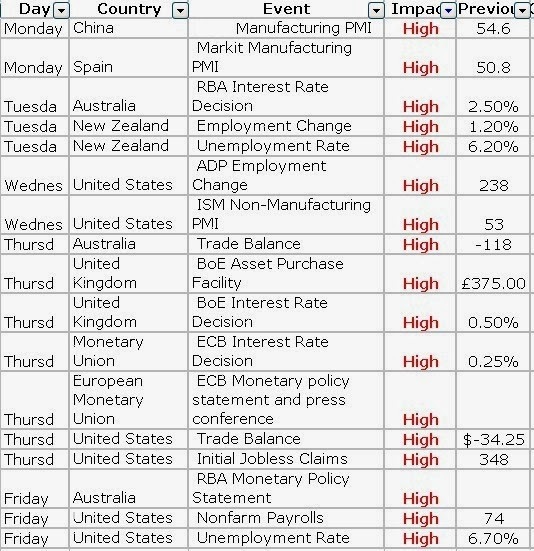 Both the European Central Bank and the Bank of England will be heard from on Thursday and then on Friday we will have the US Non Farm Payroll report, which is the big daddy of potential market movers each month. The Australian RBA will also make its monetary policy statement on Friday. The Single Currency (EURUSD) is reaching for the 200 Day Simple Moving Average (SMA), which is a Technical Analysis indicator that is respected by a great many market participants. At the same time it is on the cusp of establishing a downward trend which, as always, is characterised by lower highs and lower lows. The ECB meeting on Thursday could have a big bearing on the continuation or otherwise of this development. Inflation in the Euro zone is still very low, and the dread prospect of deflation coming into being must be playing on the minds of the members of the ECB Governing Council. Unemployment also, even if stable, is also high, at around 12%. We have already seen a surprise reduction in rates at a recent monthly meeting, last November. Will this be the case again, or will the Central Bank take other measures to attempt to raise the inflation level? If they do anything of this sort it can be expected to tend towards causing a weakening of the Common Currency. 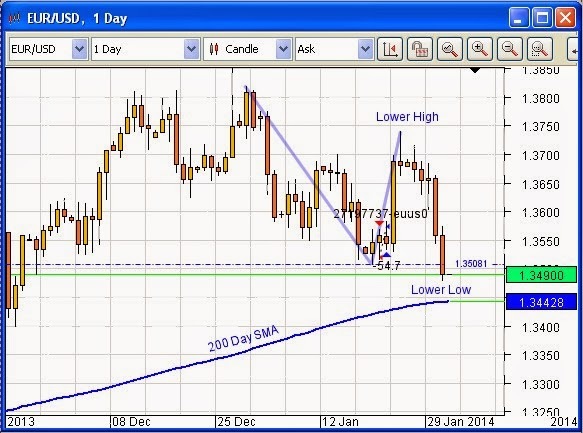 Certainly, as seen in the daily chart above, the market could be pricing in something of the sort. Our preferred way of playing this is to be short the GBPUSD pair, as the EURUSD instrument tends to range rather than to trend in the medium to long term, while Cable (GBPUSD), moves in sympathy with the Euro, at least quite a lot of the time.